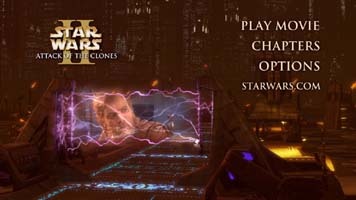 Keri Allan: Is the Episode II disc as much an epic as its predecessor? 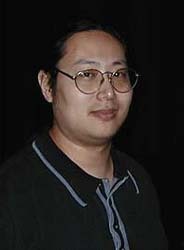 Van Ling: I certainly think so based upon the time and effort put in by Lucasfilm, THX, Fox, myself and everyone else involved. 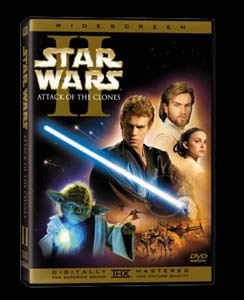 It's a Star Wars movie on DVD, so it has to reflect the epic scope of the Star Wars universe. We set a bar with the last one, and the challenge was to maintain that level of scope and quality. KA: How much time and effort was taken to create it? VL: Based upon the amount of sleep I got, I'd say it was half again what we put into the Episode I DVD, which was already a lot. Thousands of hours, between the documentary and video editors at Lucasfilm, my menu team, the compression and authoring facilities, plus all the folks at THX. It's important to realise that creating a great DVD takes this kind of effort. You can't just collect all the existing material and put it out. Well, you can, but neither Lucasfilm nor I have ever been interested in just doing that. 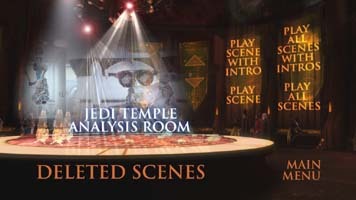 We want the movie to be the best presentation possible, straight from the original digital master in the case of Episode II, but also to make the extras entertaining and educational as well. 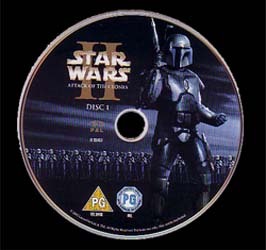 KA: What can Star Wars fans look forward to seeing on the disc? VL: Apart from the movie itself, which really does look and sound amazing on the disc - I think it's a perfect example of how well digital filmmaking can translate to DVD - there are three cool new documentaries, eight deleted scenes that were completed especially for the DVD, and hours of other goodies that the fans have come to expect. Plus some pretty fun menus. We loaded the disc to the brim again. 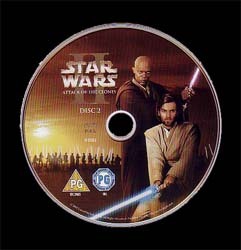 In fact, there's actually more content in terms of time on the Episode II DVD than there was on the Episode I DVD. KA: Did you have pretty much free reign on the menus and how were they created? VL: The guiding vision for the menus, as always, is the film. The great thing about the Star Wars universe is that it's so rich in design and concept, you already have an amazing palette with which to work. The challenge is taking all that and trying to create a functional and fun navigation system that stays true and does justice to that universe. And I think we achieved that. We knew that structurally, we had a winning formula from Episode I and we wanted to keep that navigation intact and focus on upping the creative side of the menus themselves, to get the viewers into the spirit and mood of the different worlds seen in the film. There's a lot more motion in the menus, which meant a lot more custom animation, to reflect the dynamics of the movie. KA: Where did the source material come from? Was Lucasfilm on hand to provide additional images? VL: We had access to both the Lucasfilm image archives and to the final digital shots from ILM, and in several instances we were able to get separated elements for shots we wanted to use. Unlike on Episode I, however, we weren't able to use as many shots "as is" for menus this time around, simply because the movie is a lot more dynamic. A menu needs to stay on screen with a stable image either indefinitely or in a 20-second loop at minimum; a typical shot from the film itself was 2-4 seconds long with whip pans and camera moves and everything needed to advance the story. There were great set pieces and memorable scenes, but few actual shots that in themselves could be used as menus. The needs of the two media are different, so we had the challenge of taking many of the cool shots and materials we got from Lucasfilm and ILM and use them as reference, and recreate the look and environment in a way that maintained their great visuals, but that also served the DVD. This meant a lot more 3D work, since in a lot of cases it meant taking this great signature shot from the film and saying "I need to pan the camera 67 degrees to the right to compose a good menu from it." Or "I need to slow this camera move to a stop, but with the action of the scene action still going. And off we'd go into building entire environments from scratch. Basically, we were subscribing to the digital filmmaking concept of the film, that you could play with a virtual environment to get what you needed to get your point across. KA: How many people worked on creating the disc? VL: Scores of people worked on this DVD to make it a great disc, from Lucasfilm to THX to the authoring and compression facilities. For the menus, though, I like to keep my team small; it concentrates the creativity. There was basically three of us: me, my video/audio editor Lauryl Duplechan, and my lead digital artist Johnathan Banta. Later, to get the menus out to tape for compression, we had Eli Jarra of Digital Chaos and Pat Grandclaudon at Performance Post to help us lay off the menu animations and audio. KA: Which part of the disc would you say you were most proud of? VL: There were a lot of menus that were really fun to create, but the one that stands out is the Kamino Options menu, with the fight between Obi-Wan Kenobi and Jango Fett on the landing platform. Using one wide establishing shot as a reference - with no fighting in it - we basically had to create a "master shot" of the entire fight, complete with lightsabers, blaster fire, rocket packs, explosions, rain and a 3D animated Jango. Plus, the menu had to loop after 20 seconds! This was one of those "wouldn't it be cool if..." moments in coming up with menu ideas, and we were just crazy enough to tackle it. KA: What was the largest obstacle in creating the disc? VL: For my end of things, I think the biggest challenge was the limited amount of time available to create all of the menus and graphics. While the documentaries and deleted scenes could be taking shape even as the film was being completed, I couldn't really get going on creating the actual menus until all the shots were done and we knew what we had to work with in terms of elements. I was able to design everything out, but I couldn't build or animate or rotoscope things without the final shots at minimum. Obviously, finishing the film itself for its May release was ILM's and Lucasfilm's most important task, so until that process was done, I couldn't get shots and elements for creating DVD menus. This is as it should be, of course; the movie should always take priority. 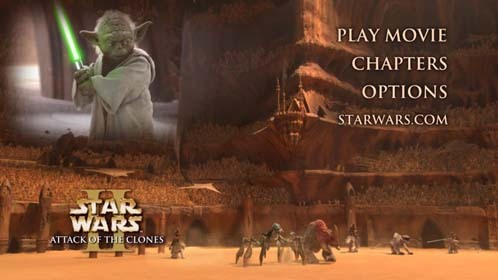 But couple this with the fact that my menu designs for Episode II required twice the amount of work as Episode I, and the fact that we needed to do menus for a dozen different languages for a simultaneous worldwide release, it adds up to a lot of long hours. Lucasfilm was really supportive. They believed in what I was trying to achieve for their DVD and they tried to help clear the way and give me as much time as possible. All in all, we probably generated over 200 000 frames of menu animation, including domestic and international versions. KA: Are there any Easter Eggs on the disc? VL: I think people should find out for themselves, don't you? KA: Thank you for your time.